One of the biggest keys to the success of a story is creating characters your readers will fall in love with. Ones they'll want to root for. Ones they'll cry with, laugh with, and remember long after they close the book. Before you ever start writing the story, spend time getting to know each of the main characters, enough so that they become real to you. We're going a little bit out of order as Diana talked about moving on from creating characters, but this is still important stuff. What are some things you should be doing as you get to know these characters? 1. Learn their back story. What in their past effects who they are as your story opens? What kind of family did they grow up in? What is their happiest memory? What is the hardest thing they've ever been through? While you may not use all of this information in the book, your past influences who you are today and how and why they do what they do. This can go a long way into determining their motivations. 2. Figure out their goals, motivations, and conflicts. In other words, what's driving them? What do they want and why do they want it? What's standing in their way? Without GMC, you don't have a story. And you don't have well-developed characters. 3. Spend time with them. I like to spend about a day per each main character, just learning a little bit about them. Asking them questions. Figuring out their likes and dislikes, where they live, what they wear, what they do, etc. This is information that's in every basic character chart. But you can dig even deeper. Write a few diary entries for your character. That will really help you feel what their feeling. Interview them, and not just the why questions Diana mentioned. Take them through a job interview, a police interrogation, or a visit to a psychologist. Or have one character interview another. Great ways to really dig deeply into your character. 4. Don't be afraid to flip the stereotypical character on his head. When I teach creative writing, I like to take my class outside to watch the cars going by and asking who they think is driving each car. Then I take them outside of the box. Instead of a mom going to pick up her kids from school, who might be driving the minivan? And why? This will make a character more memorable and will keep your reader engaged and guessing. 5. Add quirks, idiosyncrasies, habits, etc. These little things really make a reader come alive. Does she always wear the same color clothes? Does he crack his knuckles when he's nervous? Is she a neat freak? Will he only drive American cars? Also, don't forget to add flaws to your characters. This makes them more real. No one wants to read about someone who is perfect, because those people don't exist. And also add redeeming qualities, even to your villains. What is it that is good about that person, even a sliver of something. A murderer who calls his mother every week to check up on her. A kidnapper who bandages the kid's scraped knee. 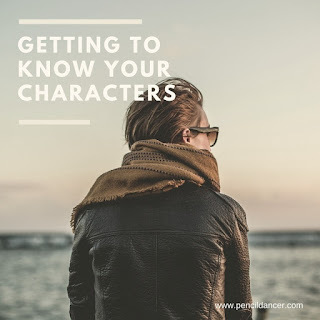 How do you go about developing your characters?